This series of controllers are based on multiphase synchronous rectification technology (MSRT) and advanced MPPT control algorithms, with dual-core processor architecture and common negative design, these features give a high response speed, high reliability, and meets high industrial standards. 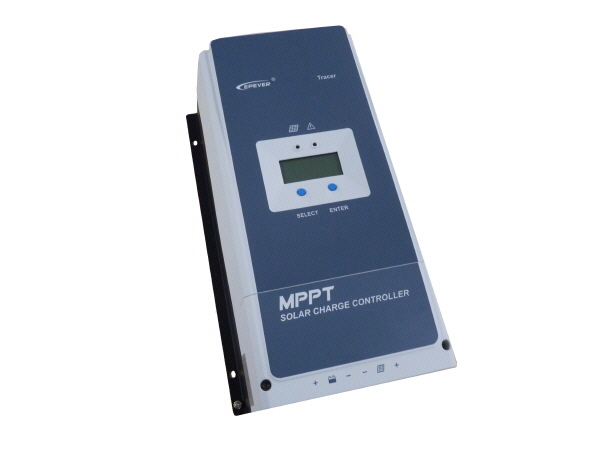 MSRT can guarantee very high conversion efficiency, which sharply improves the energy efficiency of a solar system; Advanced MPPT control algorithm minimises the maximum power point loss rate and loss time, to ensure the tracking efficiency, corresponding speed as well as a high conversion efficiency under high or low power. In any situation, this controller can rapidly track the maximum power point (MPP) of a PV array to obtain the maximum energy of the panel. The limitation function of the charging power and current, and automatic power reduction function fully ensure the stability when working with oversize PV modules and operating in high temperature environments. The adaptive three-stage charging mode is based on a digital control circuit. This series cof ontrollers can effectively prolong the life-cycle of batteries, significantly improving the systems performance. The load, utility or generator auto-control relays make it ideal to use with a solar power system and backup generator. All-around electronic protections, including overcharging, over discharging, and PV reverse polarity protection this effectively ensure a safe and reliable solar system. The isolated RS485 interface with standard MODBUS communication protocol and 5V power supply makes it easy for customers to expand the control parameters. Up to 8 controllers can be in linked in parallel for synchronised charging to meet future system expansions and monitoring requirements.